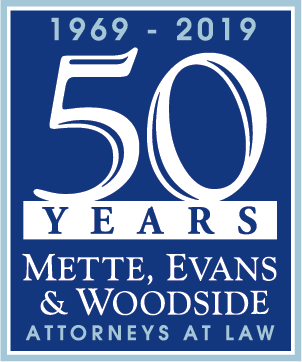 Located in Harrisburg, Pennsylvania, Mette, Evans & Woodside serves clients throughout Pennsylvania as well as New Jersey and Maryland in a broad spectrum of legal disciplines primarily in Real Estate, Litigation, Business, Banking, and Estate Planning. Our attorneys share a commitment to providing clients with the best possible legal representation. The law firm of Mette, Evans & Woodside has settled a lawsuit filed on behalf of its client, Press and Journal, Inc., publisher of the Middletown Press & Journal, against the Borough of Middletown, Pennsylvania. The law firm of Mette, Evans & Woodside announced that attorney Matt Coble has joined the firm as shareholder. How Long to Return Deposits? As a broker holding a deposit, how long should it take you to return it pursuant to the terms of a release signed by both parties or when sufficient time has passed and not litigation/mediation has been initated? https://www.mette.com/wp-content/uploads/2019/04/Return-Deposit.jpg 315 700 ME&W https://www.mette.com/wp-content/uploads/2018/12/MetteLogo_white-1.svg ME&W2019-04-15 10:07:242019-04-15 10:07:24How Long to Return Deposits? As a subcontractor, what happens if I sign releases in order to get paid for my work? Often contracts for public projects and large private projects require subcontractors to sign lien waivers and releases in order to receive periodic payments for their work. https://www.mette.com/wp-content/uploads/2019/04/contractor-at-job-site.jpg 315 700 ME&W https://www.mette.com/wp-content/uploads/2018/12/MetteLogo_white-1.svg ME&W2019-03-29 14:31:282019-04-03 09:35:29As a subcontractor, what happens if I sign releases in order to get paid for my work? Citizens are expressing their skepticism and outright anger about stormwater fees that are being assessed throughout the Commonwealth. Homeowners: Beware of Summer Hazards! Protect yourself from potential legal problems around your home. https://www.mette.com/wp-content/uploads/2019/04/pool-backyard-hazard.jpg 310 700 ME&W https://www.mette.com/wp-content/uploads/2018/12/MetteLogo_white-1.svg ME&W2019-04-02 15:14:172019-04-11 10:52:20Homeowners: Beware of Summer Hazards! Mette, Evans & Woodside partnered with RSVP of the Capital Region for our annual children’s book drive. The 2018 drive collected 7,691 books. All books collected were distributed to students aged 4 to 12 in Dauphin and Cumberland County. Take steps to avoid harassment occurring in your company. Mette, Evans & Woodside is offering a companywide anti-harassment presentation for your employees. This program, led by Attorney Kathryn L. Simpson, will educate your employees about the types of harassment, the company’s policy regarding harassment and how to report an incident.